In 2013, about a hundred cyclists gathered in Stillwater, Oklahoma, to tackle 107 miles of isolated red-clay and gravel roads in the Landrun 100. Some bikes broke. Some riders took all day to complete the distance of the inaugural race. This year, the event sold out its 1,400 spots in 36 hours. Dirt-road riding has arrived. Above and beyond those looking to pin on a number and race a “gravel grinder,” the allure of rides with fewer cars has clearly captured the imagination of cyclists. Mix the social and fitness elements of road cycling with the rough-and-tumble solitude of country dirt roads, and you have gravel riding—the booming trend in bikes for 2018. 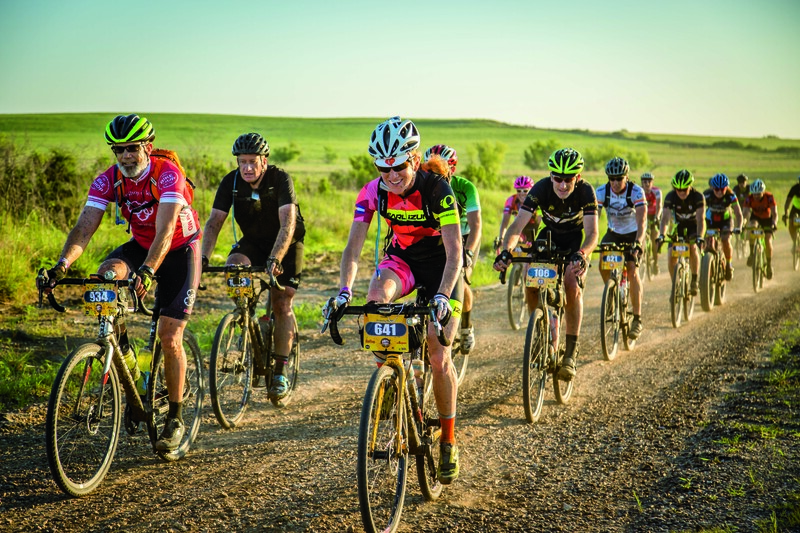 While cyclists have been pedaling skinny-tired road and knobbier-tired cyclocross bikes on dirt roads for generations, there is now a full-blown movement of dedicated gravel bikes and specialty events around the country. How big is gravel? Well, this year three-time world road cycling champion Peter Sagan is even hosting a three-day gravel event in Truckee, California. A gravel bike is a basically a road bike with clearance for big tires. What defines gravel riding depends in part on how you define gravel. Back roads in Colorado are often smooth, hard-packed dirt affairs, fitting most roads bikes just fine — so long as they’re dry. Often a normal road endurance bike is just fine. But venture to Kansas for the Dirty Kanza 200 gravel race, which crosses 200 miles of sharp, flint-covered roads, and you will want a dedicated gravel bike with wide, sturdy tires. As for a gravel bike’s geometry, it looks like a road bike with curved, drop handlebars, (usually) no suspension and tires in the 35mm-42mm range (all reminiscent of a ’cross bike). But where a ’cross bike is designed for short, intense races, a gravel bike is built for long days in the saddle. As such, they often have three, four or five water bottle mounts. So you can go long. You’ve got the hydration. If standard road bikes roll just fine on dirt roads, and mountain bikes are great for chunkier terrain, why plunk down change for a hybrid? For many riders, the appeal of the terrain leads to the appeal of the equipment. Dirt roads also have elbow room and a lot less noise. More and more riders are mixing pavement and dirt or even a little tame singletrack into a single ride, piecing together fun routes that don’t involve loading the bike into or onto a vehicle. Road bikes are also limited by tire width. More and more road bikes are now coming with disc brakes, but the fork and frame size out at 32mm widths—no good for really rocky terrain. Mountain bikes can take all manner of tires, and, of course, they have suspension that smooths out rocky rides. But on dirt roads, they’re heavy and slow, making for more work than necessary. That said, you can hit the dirt on whatever you have. In mid-February, riders on all manner of bikes competed in the Old Man Winter Rally event out of Lyons, Colorado, with 50- and 100K courses on paved and dirt roads in the snow, ice, mud and slush. A dedicated gravel bike can change the way you ride, however. If you are looking to buy, where you live and where you like to ride will determine your best choice. The selection runs the gamut from forgiving road bikes to full-suspension models. Though boutique bike brands like Salsa have built gravel grinders for years, Cannondale was arguably the first big brand to commit to the genre. The Slate Force 1 ($3,500; cannondale.com), pushes the envelope with a carbon frame, clearance for up to 42mm tires and 30mm of suspension. It’s basically a hardtail mountain bike with drop bars. There’s no mistaking the Salsa Cutthroat ($4,299; salsacycles.com), with 2.4-inch tire capability, for a road bike. This burly bikepacking beast has four-bottle capacity on small frame and five bottles on bigger frames. It comes ready to mount a rack, a top-tube bag and one or two chain rings. The 3T Exploro LTD ($4,200; 3t.bike) is an aero gravel race bike. Sure, you can find plenty of stiffer, lighter endurance road bikes, but the 3T Exploro is a legit gravel bike, with clearance for 40mm tires in 700c or up to 2.1” in 650b. Unusual in the world of gravel, this machine was also designed for aerodynamic efficiency. Specialized introduced the FutureShock on its Roubaix endurance road bike, adding a little bit of spring suspension between the frame and the handlebar. The carbon Specialized Diverge Expert ($4,000; specialized.com) has that same FutureShock plus a low, relaxed geometry for stability in nasty terrain, and clearance for up to 42mm tires on 70cc wheel or 47mm tires in the 650b wheel size. If you are on a budget, the Diverge Comp E5 rings in at $1,800 with an aluminum frame. A few companies make road-bike-similar gravel race bikes—stiff, fast, and light. And some of the smaller core gravel brands have gone off the deep end with bikepacking weirdness. But somewhere right in between sits the Norco Search XR Force 1 ($4,199; norco.com), which handles big tires, fenders, racks and bottle cages on the fork legs—but it also feels like a frisky bike and not a stubborn, plodding mule. Gravel events run the gamut from low-key group rides arranged via email to massive affairs like the Dirty Kanza 200. Here in Colorado, the Gold Rush Bike Rally (bouldergoldrush.com) is the summer sibling of Old Man Winter Rally (voted best bike event in the annual EO Best of the Rockies reader poll). Expect to see all manner of bikes from road to mountain to gravel For a complete list of gravel events around the country, check out gravelcyclist.com/calendar/. For more detailed gravel riding info, get Gravel Cycling : The complete guide to gravel racing and adventure bikepacking by Nick Legan ($25; ramblieur.com). As an elite cycling mechanic, Legan wrenched bikes in events ranging from the Olympics to the Tour de France, and his passion for gravel preceded the trend by years. He has participated in scores of events, including multi-day monstrosities like the 2,745-mile Tour Divide, and is downright evangelical about getting others into gravel riding. Packed with inspiration and information on both events and the huge variety of bikes and gear involved, Legan’s 304-page book has 320 photos that showcase gravel experiences around the U.S. and the world. —Ben Delaney is the US editor-in-chief of BikeRadar and the former editor-in-chief of VeloNews.